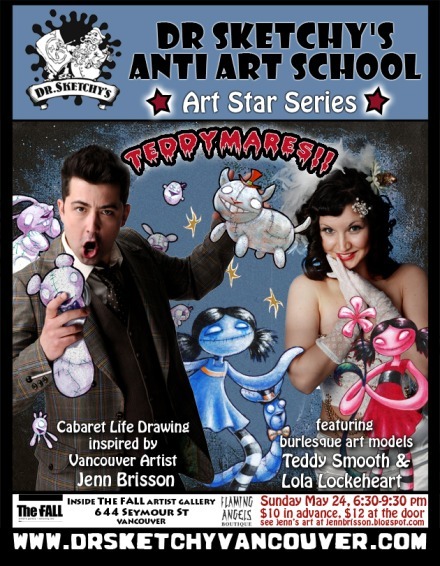 The Dr Sketchy's Artist Series features burlesque art models dressed as characters from the paintings of Vancouver based artists. View your favorite artist's paintings in the gallery, talk to them about their work, and see art come to life on stage! No matter what artisti...c level you are, everyone is welcome to tweak their drawing skills. Jenn Brisson's teddybear minions will be giving us nightmares when Teddy Smooth and Lola Lockeheart bring them to life! Bring your pencils and sketchbooks- this ain't no teddy bear picnic! Posted in 2009 and tagged with Jenn Brisson, Lola Lockeheart, Teddy Smooth. May 24, 2009 by Shary Contrary.